Go cruising on the Venice Lagoon and enjoy some of Europe's finest monuments and landscapes. Separated from the sea by a narrow coastal strip, the Venice lagoon contains sleepy villages and historic towns, untouched landscapes and picturesque villages. Our base at Chioggia is a delightful little town with an amazing fishmarket, linked by bridges to the mainland, and the southern gateway to the lagoon. You follow the buoyed channels to the yellow and ochre houses of the traditional fishing villages of Pellestrina. Beyond the Malamocco opening to the sea, you set course for Venice. The Campanile and the Piazza San Marco gradually appear over the horizon. Arriving in Venice by water gives fantastic views across to the greatest glories of the Serenissima, the Doges' Palace and the famous St Mark's. After cruising these enchanting islands with their gaily painted facades of quayside houses, you can extend your cruise up the canalised River Brenta. Enjoy its verdant banks, delightful countryside and sun-dappled vineyards. Far in the north eastern lagoons, Marano, remote and unspoilt, is at the furthest northern reaches of the Adriatic. Its ancient township, surrounded by marsh and forest, is still home to a fishing community. Navigation is possible every day on the lagoons. On the Sile and the Brenta there are certain closures. Chioggia - Venice and islands - Silea - Treviso - Chioggia. Chioggia - Venice and islands - Jesolo - Caposile - Marano - Chioggia. 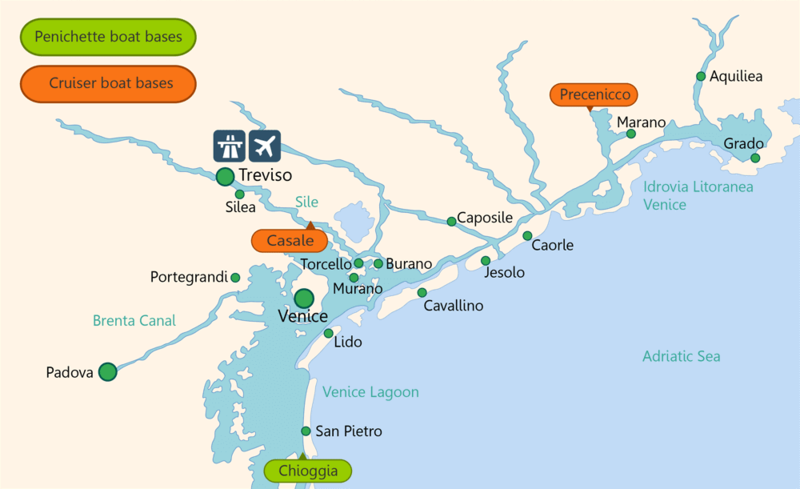 Chioggia - Venice and islands - Jesolo - Caorle - Grado - Marano - Lignano - Cortelazzo - Pontegrandi - Chioggia.